With the amount of data now available on the Internet, it is often needed to gather this information and store it into a database or text file (or any file) to be imported into an Excel or Word document (or any programs). Such task, until now, was only available to experienced programmers. Now, with the introduction of the BrownRecluse Programmable Spider, anyone can scan a web site and retrieve from it the information they need. Simple: Very simple. In just 4 lines of simple code, you can download a web page and display its source code (or save the file). You do not need to know anything about programming sockets and protocols, everything is built-in the language. The URL object lets you perform all the Internet commands such as GET and POST and all of its properties are automatically set (headers, size, date, type etc.) A powerful regular expression object (RegEx) lets you find the data you’re looking for from web pages. The File object lets you save collected data to a file. Use the Format object to easily format your data to a CSV, or a tab delimited field. 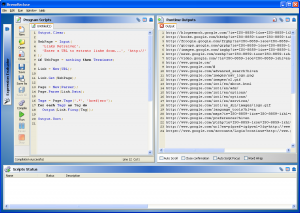 The Output object lets you output your data to one or more output window. A powerful Stack object lets you save your data to an internal list. There is so much to say that the best thing for you to do is download and try it for yourself. It is fully documented (html help file and PDF included). User Interface: The user interface is easy and simple, but don’t let it fool you. The extra icons in the title bars let you set anchors to your windows so they follow the edges of the main window. You can also place the title bar on any of the four sides depending on your setup. The windows are movable, and, by a single click, you can roll up/down those windows. The editor is clear with highlights and fully customizable. The tool button bar can also be placed on any of the four sides of the window. Right context menu and sensitive help lets you find the documentation of the current word quickly and easily. Compiler? : Almost. Unlike other compilers, BrownRecluse does not compile your script into an EXE file. Instead, it simply runs it so you don’t waste any time. If there are any syntax errors, the editor will let you know first, showing where the errors are. You can Pause and Stop the execution of your scripts at any time. Multitasking: BrownRecluse lets you run more than one script all at the same time. Each have their own Internet connections and variables. 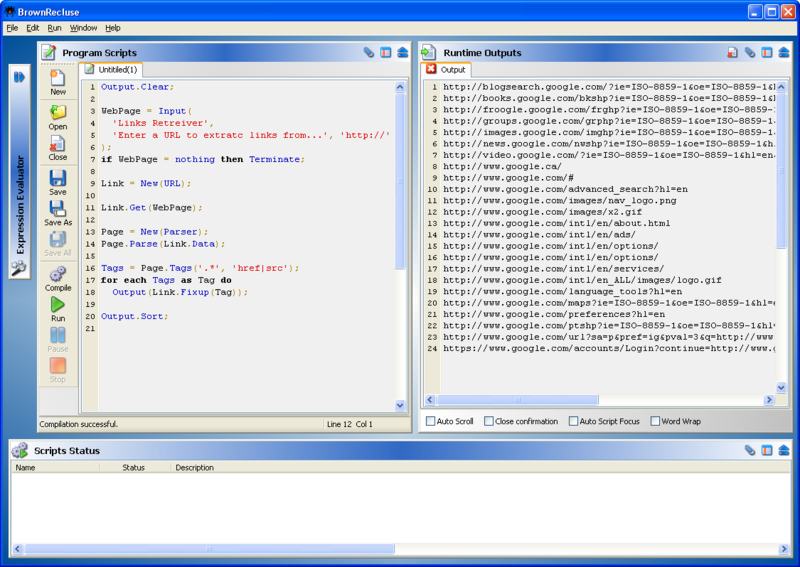 The output windows can be shared among all running scripts. Stopping or pausing a script does not affect all other running scripts. Filters? : There is no need for filters, options and plugins. You simply program it to scan (or not) a URL depending on your criteria. Using the RegEx object, it makes it easy to only pull the files you want. The URL object also lets you check if a link is of a type you want to keep, such as image/jpeg or audio/mp3. That alone takes care of all the filtering, options and plugins. Usage: It is basically up to you as to what you use it for. But to highlight a few example, you could scan a Real Estate web site and collect all of the agent addresses, phone numbers and emails, and place all this data into a tab delimited database file. Then import this data in your Excel application. You could also scan unlimited number of URLs for keywords and keeping the URL of those containing the keywords. You can also monitor a web page for changes, and when the page has changed, run your web browser to show the page (or run any other application). Use it to scan a web site for images or mp3 files and save them. There are countless number of applications you can use BrownRecluse for. Owner license: $79.95 USD, include unlimited free updates and priority support.